pink mafia - one word, gorgeous! i love everything about it. Pink Mafia! I have sissors like the ones you have inked on! They are swan-esq.. lovely! Thank you everyone. I'm really excited to finish it. Sadly my artist is moing to another island so I won't be able to get anymore work from her. I think the scissors go with the asian theme. Oh they definately go with the asian theme..lovely. Oh wow. Your Ganesh tattoo is beautiful. I love the colors and the style. The homage to craftiness is neato. Did you design it yourself? So many things fail to interest us, simply because they don't find in us enough surfaces on which to live, and what we have to do then is to increase the number of planes in our mind, so that a much larger number of themes can find a place in it at the same time. I have one on the front of my arm and as it got closer to the inside it started swelling right away - so much so that I have to go back and get the coloring done - it was not quite as painful as I thought it would be... Its not completely on the inside, so I don't know about the usage factor! Thank you for your input! I didn't except to hear about swelling...never thought of that! I thought the healing was waaay worse than the tattooing on my inner arm. I had to be careful not to swing my arm when I walked, to hold it a little distance away from my body at all times, and to wear shirts with sleeves that either completely covered or completely bared the tattoo, so that the hem wouldn't irritate it. Plus with the amount of swelling I got, I didn't want to show people because I thought my arm looked fat. (Silly, I know. But still.) The holding-my-arm-out-to-the-side phase lasted about a week and it was occasionally tender (like if I made a bad shirt-sleeve choice) for about another week. If you have a desk job, it probably won't be too big a deal, but if you're planning on doing something that involves using your arms (hee! I can't think of another way to put it--it's way too late to be awake--I tried to think of an example but I can't actually think of anything that DOESN'T involve your arms, except soccer) or if you have a low tolerance for pain or are a slow healer, you might want to think about getting them done one at a time. Wow...hmmmm...I don't know what my job will be in the future...my current job...no way I could do it then! Ha ha...but sadly I will be leaving that for a job that involves way less. Since I have to wait anyway, not a big deal. Thank you so much for your input. I was actually thinking about waiting until next summer (no money now ) so I wouldn't have to worry about wearing any sleeves at all. I'm pretty good with pain, so I'm not TOO worried, but I didn't even think about my job. Thank you again! I have two- one I got when I was 17 and the other is my family monogram that my hubby and I got on our 1 year anniversaries. Now, if I can figure out how to post a picture I'll show them to you! Warning- the one on my lower back is a but "furry"... Goose Down is what my hubby calls it. I call it disgusting. i love it! 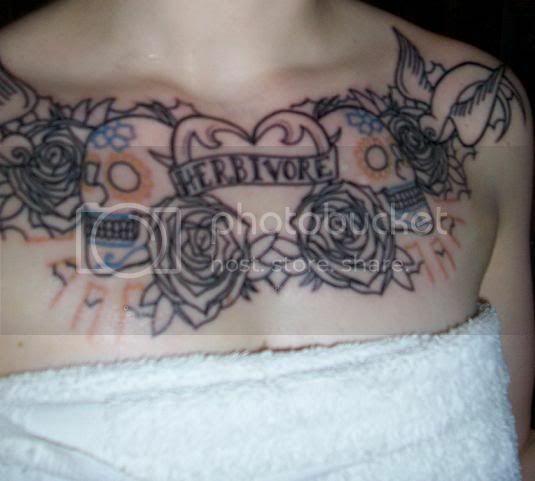 that was very brave of you to get a huge chest piece for your first tattoo!! i would have chickened out for sure if that was my first tattoo! it's fantastic. i especially love the style of the roses, and the pretty birdies on the ends. what colors are you planning on doing? I love personal swaps! Just ask me about them! I have tons of fabric to trade for maybe other fabric..or knitted or crochet items!! !